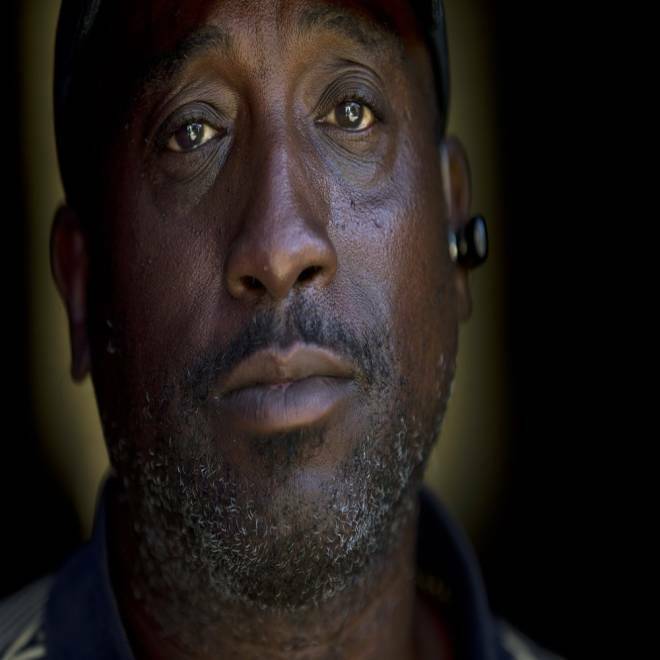 Homeless veteran Jerome Belton poses for a portrait at a homeless shelter in San Diego on September 19, 2012. A former Marine, Belton now lives on the streets in San Diego. The latest report card on the Obama Administration’s push to end veteran homelessness by 2015 arrived Monday: the number of ex-service members sleeping in parks, under bridges or in public spaces declined by 7 percent this year, the U.S. Department of Housing and Urban Development (HUD) confirmed. But other advocates — including a small cadre of soldiers who use their spare time and combat skills to track, clothe and house veterans forced to live outside on home soil — say they still are seeing an "alarming" rise in younger homeless veterans, many of whom fought in Iraq and Afghanistan. HUD released Monday afternoon a full 2012 count of homeless Americans, including a fresh tally of homeless veterans: "On a single night in January 2012, 62,619 veterans were homeless," the agency said. Veteran homelessness has now been reduced by 17.2 percent since January 2009, the agency said. Before that report was made public, the head the National Alliance to End Homelessness (NAEH) said a fortified federal effort to house more disabled and low-income veterans is working. One of those approaches, Roman said, is a $60 million initiative by the U.S. Department of Veterans Affairs that offers prompt financial help to ex-military members on the brink of eviction — or those recently turned out of their apartments. In fact, the VA estimates that its Supportive Services for Veteran Families (SSVF) program will have helped the 42,000 veteran families by the end of 2012, according to an agency spokesman. “Sometimes people get laid off, can’t pay their rent, and lose their apartment. It’s a high cliff to get back into an apartment because you have to pay the first and last month’s rent plus deposits,” Roman said. “In most places, that’s $2,000 or $3,000, minimum. If you had $2,000 or $3,000, you probably wouldn’t have gotten evicted in the first place. So this program helps with that sort of thing. "There’s been a lot of determination at VA to make the homeless veteran numbers go down," she added. "I’d be very disappointed if they don’t go down, frankly." Veteran Arthur Lute holds his 5-month-old son Evan in his one-bedroom apartment in Chula Vista, Calif. on Oct. 9, 2012. Lute's arduous journey from his days as a U.S. Marine to his nights sleeping on the streets illustrates the challenge the Obama administration faces to make good on its promise to end homelessness among veterans by 2015. VA spokesman Josh Taylor said the agency already had gauged critical gains as the rate of veteran homelessness dropped by 12 percent from 2010 to 2011. He cites, in part, SSVF – “our new homeless prevention and rapid re-housing program” which during the 2011 fiscal year helped house more than 35,000 people, including nearly 9,000 children, Taylor said. A second federal program – one forged through a HUD-VA partnership – gives “eligible veterans” vouchers to pay for stays "in a residence of their own,” Taylor said, adding that nearly 40,000 veterans have accessed that program during the past two years. According to a HUD report issued in December 2011, there were 67,495 homeless veterans in this country - down from 76,329 one year earlier. The same report projected the homeless veteran population would shrink to 45,797 during 2012. In its 2013 budget request, the VA asked for $333 million in additional funding – an increase of 33 percent over 2012 – so that it could provide “specific programs to prevent and reduce homelessness," the VA said in making the pitch last February. The overall VA budget request for 2013 totaled $140.3 billion. “We have made good progress, but there is more work to do,” Taylor said in an email to NBC News. “Our homeless initiatives are based on a strategy of rescue and prevention. Three soldiers leave war in Afghanistan only to battle post-combat demons. Producer: Meredith Birkett. Video editor: Shanon Dell / msnbc.com. “The unprecedented effort under way, and the unprecedented resources being dedicated to it, have played a major part in the reduction of the veteran homeless population over the past couple of years. That work is ongoing and we expect it will continue to show progress,” Taylor added. Late last week, during the 2012 National Rural Housing Conference held in Washington, D.C, experts reported veteran homelessness is growing in many rural areas, in part because young men and women from small-town America are 21.5 percent more likely to join the military than their urban counterparts. “Veterans’ homelessness isn’t going to end unless we work together,” said Kelly Caffarelli, president of The Home Depot Foundation, a conference sponsor. During the past two years, the Home Depot has donated more than $30 million to veteran housing issues and homelessness and recently announced it will be contributing another $50 million to those same issues over the next three years. “We need the government, community-based groups, foundations, and the private sector to take up this challenge. Our veterans deserve nothing less than a safe place to call home,” Caffarelli said. In Southern California, where Army veteran Joe Leal routinely leads a handful of active-duty and former service members on personal missions to find and help homeless veterans living “beneath bridges and in canyons,” Leal said he has encountered thousands of post-9/11 veterans without homes. “It’s alarming,” said Leal, an Iraq War veteran who founded the Vet Hunters Project in 2010. His group, funded by private donations, has worked to place more than 2,600 veterans in temporary or permanent homes, he said. Monica Figueroa, 22, was an Army parachute rigger who served from 2009 to 2011, spending time in Germany, performing test jumps out of planes. She has a 17-month-old son and is married to Sgt. Jason Snyder, a 30-year-old Army reservist, who served four tours in Afghanistan and Iraq. While Snyder was still overseas, Figueroa couldn’t hold a job and couldn’t find a home for herself or her son. She slept in a car for several weeks near Los Angeles, she said. “When we met her, she was living in a garage where they repair vehicles,” Leal said. “She was bathing in a sink where they wash car parts. Monica was just overwhelmed. She joined the military when she was young. She got out. She had a child. She was used to the fast pace of military life. And then, in getting out, the transition (preparation she received from the Army) was lacking. 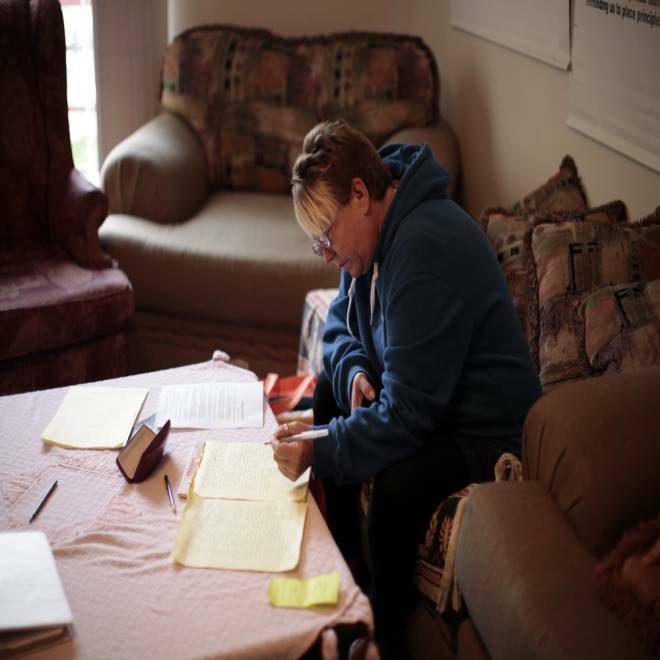 Army veteran Tara Eid, 50, writes an essay at New Directions women's house, a long-term transitional program for female veterans dealing with issues of homelessness, trauma and addiction, in Los Angeles, Calif., on November 18, 2011. Eid has seven children and was homeless many times over a period of 10 years. The Vet Hunters Project helped Figueroa, her son and husband recently move into a furnished temporary apartment in Loma Linda, Calif., and enter a program that provides them financial counseling to prepare for an independent life. “Before this, my living situation was very unstable, moving from one house to another. Just jumping. Just living anywhere I could, with family members, friends, anybody who could help me for two weeks or so,” Figueroa said. “I had to leave my son with my mother — there was no room for anyone else where they were living. So I stayed in a car that my dad owned. It’s not uncommon, in fact, for the Vet Hunters to come across Army reservists who are still serving the country but who have no home, Leal said.